I am one of those lucky people who have never needed an alarm clock, I listen to my body, meaning I go to sleep when I'm tired and wake up when my body wakes up. I've been very lucky that this system has worked for me. I've always been an early riser, so being late for work was never an issue, because my body got use to waking up at the same time everyday, around 6AM, no matter what time I went to bed. The system has a glitch. Rob changed shifts a few months back, and because he needed to get up at 4:30AM, we started setting the alarm clock. I started getting up with him, we have coffee together, I make our lunches, and it enabled me to get to work for 7AM, so I could leave earlier in the afternoon and avoid rush hours. Win-win situation. The glitch? 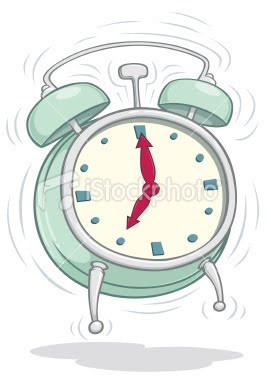 My body clock has adjusted itself, and I am now waking up just after 4AM ON WEEKENDS! This I am not so happy about, getting up this early on a weekend morning is even too early for this early bird. Saturday morning I was able to get back to asleep for another hour and a bit, this morning, no such luck. I've already got supper in the slow-cooker, had my first coffee of the day and sent a few e-mails, and it's barely 6AM. We were out to a movie last night, and didn't go to bed til just after 11PM. Five hours sleep is not enough for me to make it through the whole day, I see a nap in my future. 4 o' clock at the weekend is not good. I find the older I get, the earlier I wake up in the weekends ... it's 8:00 rather than 10:00. 8:00 is fine ... 4:00 not so much! Enjoy your nap this afternoon!